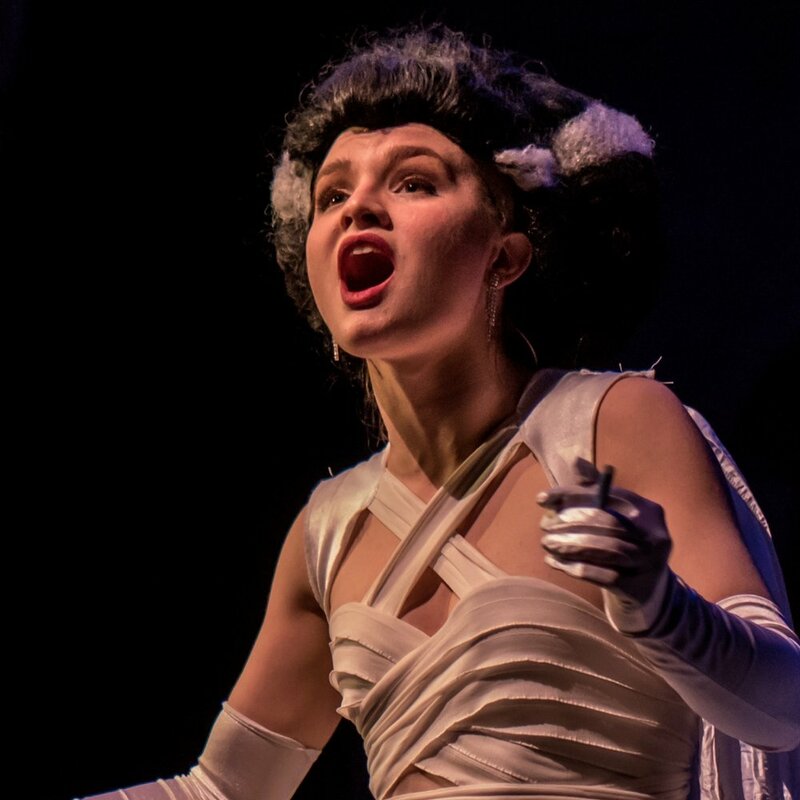 Emma Ruth Mathews is a third-year Theatre, Accounting, and Marketing major from Atlanta, GA. She currently is playing Elizabeth Benning in Young Frankenstein, the Musical. Who is Elizabeth to you? Honestly, I’m still trying to figure this one out! My perception of Elizabeth has changed pretty frequently over the course of this process as we’ve gotten into the weeds and had time to play around. Elizabeth is a wealthy, self-obsessed socialite who would much rather spend her time primping and attending parties than doing anything of substance. She reminds me a lot of Gloria from F. Scott Fitzgerald’s The Beautiful and the Damned, so I’ve been borrowing a few character ideas from the novel. She is young and naive, and while she may seem cold towards Frederick, I think she truly means well. What are your favorite things about Elizabeth? What are you least favorite things about her? For completely selfish reasons, I love how glamorous she is. I spent my last two UGA productions covered in dirt and dressed like a farm boy, so it is pretty delightful getting to glam up and wear such beautiful costumes (thanks to Ivan and Desiree)! I also have to love her confidence. As actors and human beings, we all struggle with feelings of self-doubt and worthlessness, so it has been a great deal of fun getting to shake off those feelings and belt, “It’s me!” over and over and over again. Elizabeth does not ever apologize for her presence and neither should I! It’s tough to pick a least favorite characteristic because I’ve had to rationalize all of her behavior to get into her world. She isn’t very good at thinking of other people which can get her into trouble, but I wouldn’t say that’s necessarily my least favorite thing. Yes!! I’ll admit, it took me much longer to get around to watching the film than it should have. I watched a handful of scenes when I was preparing for auditions and callbacks, but after that, I got sidetracked and never sat down to watch it. Finally, there was a day in rehearsal where I had some idle time, so I popped in my earbuds and watched the whole thing. I’m so glad I finally got around to it because it gave me such a renewed perspective on the humor in the show and the characters. Obviously the writers had to make some changes to make the show fit for the stage as opposed to the screen, so there are longer scenes, fewer locations, etc. The character of Elizabeth was very different in the original Broadway production (much more scandalous, also very confusing), but I think the production brings her back towards Madeline Kahn’s interpretation. People should come in expecting the original performances to be honored, but not copied exactly. Our directors have been very clear with us in our scene work that we are paying homage to the original actors but also expanding on their performances and putting our own stamp on the characters. I saw an amateur production of this show when I was in high school, and one of the aspects of the show that really stuck with me was (spoiler alert?) when the Monster kidnaps Elizabeth and, as the show’s Wikipedia page puts it, “forces himself on her.” I was pretty wary of the show for a long time because that feels like it borders on perpetuating this notion that sexually repressed women/individuals actually want it, they just need someone to show/force/guide them. Once we started rehearsing this production, the creative team and I all felt pretty strongly that we did not want the scene to come across this way and thought of some ways to spin it. I won’t give too much away, but I think we’ve done a good job of flipping the script and making consent happen.